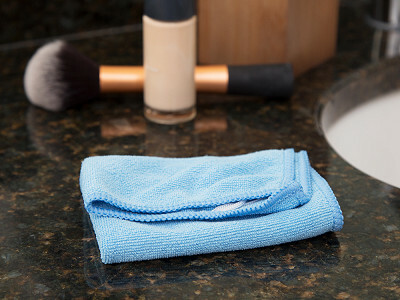 Freshen up and wick off the dirt, grime, and oil from the day with just water and this makeup remover cloth. Its thin-as-hair microfiber weave cleans your pores after a quick dip in warm water. The cloth isn’t treated with soap or other substances, which makes it extra harmless on sensitive skin and sensitive areas of your face (think: mascara-coated lashes). FaceOff is eco-friendlier, too. You’re not throwing out makeup wipes after a single run. Once the dirt is off your face and on the cloth, wash it off with soapy water, then rinse. It all comes right off and your cloth goes back to its original, super-white form. Maker Adine Binder knows the perils of face cleansing all too well. She struggled with acne and breakouts into adulthood and wanted a straightforward, soft solution. She distilled it to a single, dependable ingredient: water. Thoroughly wipe off the day’s grime with something portable, super-soft, and gentle on your skin. Hello everyone! I'm proud to introduce FaceOff to The Grommet. I'd be happy to answer any questions you may have! looks like a great product! my wife is asking if it removes mascara? At some point this needs to be washed and dried. Can it be machine washed? Does it need to be replaced after a certain amount of time or uses? Thanks! @Michelle FaceOff needs to be washed with soap and water after each use. It is machine washable. Avoid bleach and fabric softeners. FaceOff should be replaced after 3 to 4 months. Wanting to clarify - will it remove waterproof mascara, too? What kind of fabric is this made from? What is used to clean? Do I add my current cleansing product? I do not want any chemicals on my face and currently use a Neutrogena cloth on my eyes and soap from Estee Lauder that I love. @Debra FaceOff doesn't require any additional soap or cleansing products. The beauty is that all your makeup will come off with just warm water and the cloth. It eliminates the need for chemicals, detergents and other substances that can irritate or harm your skin. What is the difference between this and any other microfiber cleaning cloth that's out there that's not meant specifically for the face? @ClaudiaFaceOff’s secret lies within its unique weave of ultra-thin micrifibers, designed to gently lift dirt, excess oil and impurities leaving the skin feeling fresh and healthy. The microfibre technology is hygienic, effective and suitable for all skin types. @Adine so in other words any 'ultra thin microfiber' cloth would do the same thing? @lisa sorry I can't speak to other products. I just know what FaceOff does. This looks like a great product. My problem area is the tender under eye area that ends up with smudged mascara. Do you need to work at removing that or is it a relatively gentle swipe of the cloth to remove? @janet Its a very gentle swipe. No need to vigorously wipe. @Guest I am going to have someone from The Grommet reply. Hi, you have to go through the checkout process a little bit to see the discount. Let me know if that doesn't change anything. What is considered a mild soap to cleanse the cloth after daily use?